A single bone artefact found in a Moroccan cave is the oldest well-dated specialized bone tool associated with the Aterian culture of the Middle Stone Age, according to a study by Abdeljalil Bouzouggar of the Institut National des Sciences de l’Archéologie et du Patrimoine in Morocco and colleagues. The make and manufacture of the tool are distinct from similarly-aged sub-Saharan artefacts, suggesting a unique technological industry in North Africa. The tool was recovered in 2012 from Dar-es Soltan 1 cave, located about 260km inland from the Atlantic coast of Morocco. Upon close examination, Bouzouggar and colleagues were able to identify the origins of the bone as a large mammal rib with evidence of having been shaped and sharpened into a 122mm-long knife through a complex series of modifications. The layer containing the bone knife has been dated to approximately 90,000 years ago, approximately 55,000 years after the first appearance of the Aterian culture. This tool and the technology used to create it are distinct from bone tools of similar age in southern Africa but similar to two tools known from the El Mnasra cave site in Morocco which is also of similar age, suggesting a unique North African Aterian bone technology. Specialized bone tools are considered a sign of cognitive complexity but have been poorly-understood with the Aterian technological complex, so this finding represents a new insight into the development of modern human cognition. The authors also suggest that this new technology may have come about in response to changing resources around 90,000 years ago but note that more study will be required to support this. 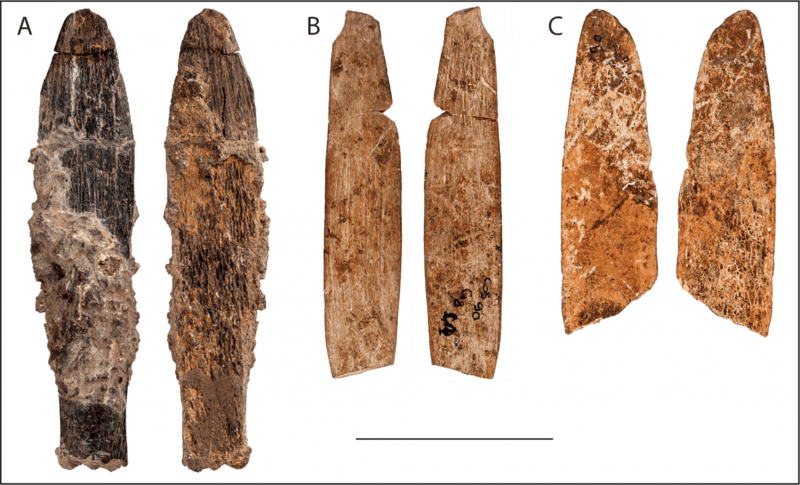 Header Image – Middle Stone Age bone knives from Dar es-Soltan 1 and El Mnasra. (A) Dar es-Soltan 1 bone knife; El Mnasra (B) refit of E9-233 with E9-229 and (C) D11-T194. Cortical and trabecular surfaces. Scale = 50 mm. (Relief map modified from Wikimedia Creative Commons).